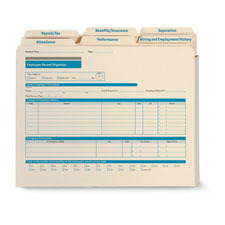 The Employee Record Organizer contains six different file folders in one to help you centralize records and make paperwork much easier to file and retrieve.These six folders not only organize your paperwork - they actually help simplify it - by capturing important personnel information right on the folder itself. 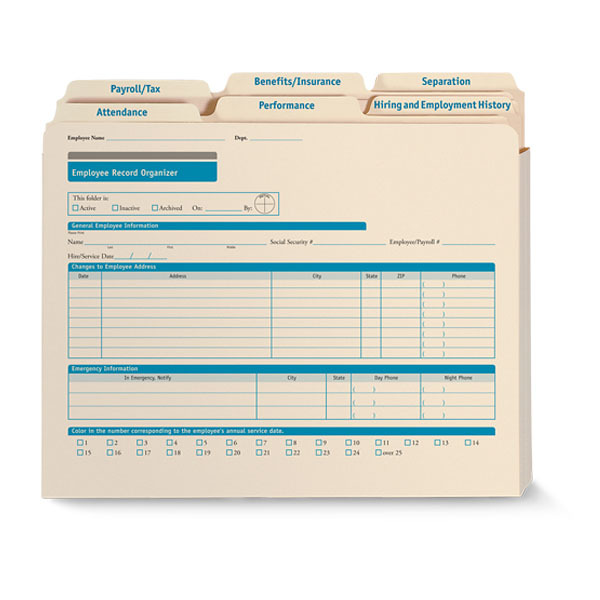 Space for confidential information is concealed on the inside of the folder. Plus, all six sections tuck neatly into the outer jacket - which fits in any standard-sized filing cabinet. Every folder has gone through a comprehensive legal review to assure it complies with current employment laws, a safeguard that no other system offers. Size: 11 3/4" x 9 1/2"